Our skin is the largest organ on the body and plays a big part in our overall health. It is the first line of defense against the elements and disease. Despite its incredible ability to ward off disease and protect our bodies, when we don’t protect our skin from too much sun and UV exposure, there are issues such as skin cancer that can occur. Dr. Yoo has been perfromed skin cancer treatments for years and has provided amazing results to many of his patients. 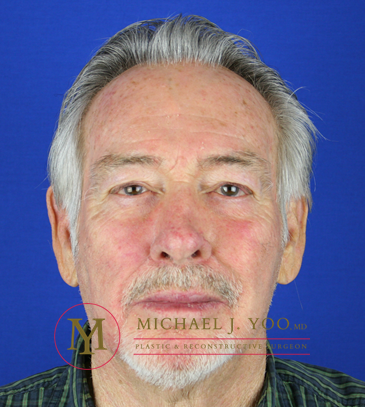 To learn more or to find out if you are a good candidate, please contact the office of Michael J. Yoo today and request a private consultation. Any mention of the word “cancer” can be scary, but skin cancer is generally very treatable. Skin cancer treatments are effective, and many methods are successful for addressing all kinds of types of skin cancer. If you’ve been diagnosed or are concerned about some signs and symptoms, seek treatment right away, and you can achieve good results. Moreover, after treatment, there are reconstruction techniques that can effectively restore the cosmetic appearance of a treated area. There are various types of skin cancer, each appearing differently on the skin. Skin cancer is the most common type of cancer in human beings. Daily sun exposure over a lifetime predisposes an individual to develop a skin malignancy. When skin cancer must be removed, the area operated on may have to be reconstructed in order to restore normal appearance and functionality. What typically happens with skin cancer is that something goes wrong in the normal growth patterns of the skin cells. Broken skin DNA sets off a chain reaction where mutations, defects, and problem cells will multiply out of control. Checking yourself regularly for signs and symptoms is the best defense against skin cancer. Knowing what signs and symptoms to look for and being knowledgeable about your options will give you a big advantage. Amongst fair-skinned adults, the prevalence of skin cancer is quite common, showing in as many as half of fair-skinned people who reach the age of 65. Again, even with those kinds of numbers, with the treatments and medical knowledge we have today, the outcomes are good. Melanomas are often very dark in color and can appear similar to moles. Pain, itching, and growth of the mole is a sign that it may be aggressive. Skin cancers will mostly fall into three types: squamous-cell skin cancer, basal cell skin cancer, and melanoma. Each type of skin cancer varies in how they appear on the skin. There are a number of other, more rare types, of cancer or precancerous growths such as actinic keratosis, typical moles, and Merkel cell carcinoma. Basal-cell skin cancers and squamous-cell skin cancers are the most common types and fortunately some of the least dangerous. Melanoma is more dangerous but far less common. Basal-cell skin cancer or (BCC), is usually found around the head, neck or shoulders and will look like a small, pearl-like, raised, bump. Occasionally, blood vessels may be visible in the bump and bleeding within the center can occur. BCC is very treatable and can be removed with little to no scarring. Squamous-cell skin cancer, or (SCC) is the second most common type found. SCC looks like a red patch on the skin that has scaling and darker colors. This type may spread and grow in size. Ultraviolet light, which you are exposed to when you are out in the sun or under a tanning bed, is one of the biggest known culprits that lead to skin cancer. Fair-skinned people who live in places where sunlight is especially intense are most at risk. Rates of skin cancer in countries such as Australia are disproportionately high. Fortunately, there is an effective and accessible tool for preventing skin cancer. Sunscreen is highly recommended and proven in preventing melanoma and squamous-cell carcinoma. Regular, daily applications of sunscreen, especially on areas of the body that are exposed to the sun such as the arms, neck, and face, can significantly protect you from skin cancer. Smoking tobacco has also been shown to increase your risk of skin cancer. Even on overcast days, for those with sensitive skin prone to sunburn, sunblock is highly recommended. If you’re concerned with the appearance of any skin lesion you might have, consider visiting a plastic surgeon or dermatologist. For the two most common types of skin cancers, basal cell carcinomas, squamous cell carcinomas, the best option for treatment is Mohs micrographic surgery. There is also a technique called “excision” which is typically used for melanomas. Excisions are simply a procedure where the cancerous skin is cut out. The size and location of the affected area are important factors that help determine which technique is used for its removal. Excision: For smaller skin cancers located in non-cosmetically sensitive areas (such as the back), direct excision is usually the best choice. In most cases, this can be performed in the office using local anesthesia. A small margin of normal skin is included in the specimen in order to ensure all the cancer was removed. The resulting wound is usually closed directly with sutures. Mohs Surgery: Depending on the size and location of the affected area, more advanced removal techniques may be necessary, such as Mohs Surgery (named after the surgeon who developed this technique). This technique involves the removal and microscopic analysis of the skin cancer specimen. If it is discovered that the skin cancer resider deeper in the skin, another layer is then excised and analyzed. This is repeated until the cancer is completely removed and no longer detected. Mohs surgery is a technique that has been around since the 1930s but has evolved along with modern medical technology. The Mohs surgery offers many advantages. Mohs surgery is a single-visit outpatient surgery, meaning that you will be in and out on the same day of the procedure. Other bonuses are that it is a highly precise technique that offers minimal scarring and leaves healthy tissue undamaged. 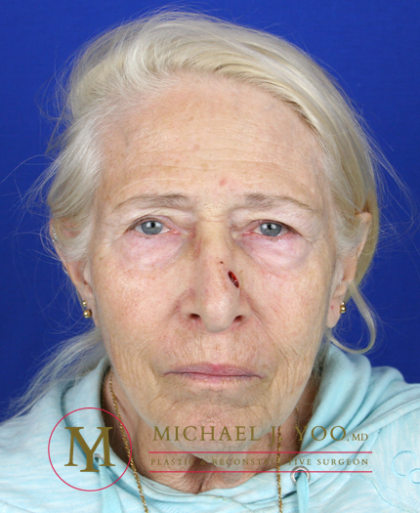 The cure rate for Mohs surgery is incredibly high, reporting removal of as much as 99% of skin cancer on the body that has not been treated before, then as high as effective against 94% skin cancer on the body that has recurred after initial treatments. 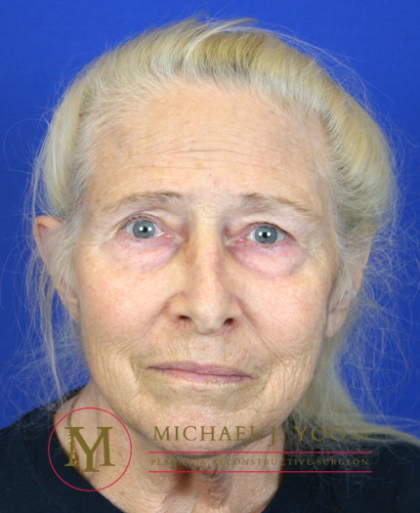 Mohs surgery is the best treatment option for the most common types of skin cancers and is great for treating skin cancer on many areas of the body, even highly visible areas such as the face and neck. Mohs surgery is also an effective option for recurrent skin cancers, cancers with unclear borders, hard to see growth patterns, large cancers in unusual areas, and skin cancers that have not been eliminated by previous treatment. Skin cancers that have not penetrated deeply into the skin or are very small in size are also treatable by methods such as freezing, scraping, and heating or even topical treatments can be effective. Facial skin cancers can be very distressing, as their treatment can at times entail a large excision that leaves behind a sizable wound. In this case, reconstruction may be recommended. Reconstructive techniques have advanced considerably to give results that are very acceptable. The size and location of the resultant wound will help determine the type of reconstruction technique used. With skin cancers that are larger, a local flap reconstruction, or skin graft is often used. Reconstruction techniques like flap reconstructions and grafts are procedures where skin is taken from another area or an adjacent area of the body to rebuild the appearance of the wound. 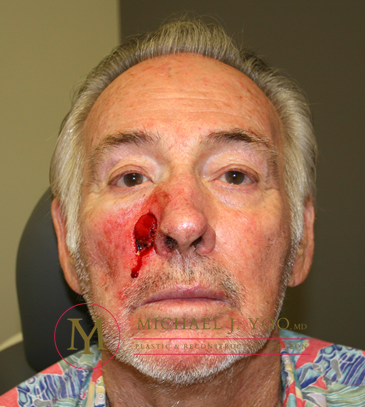 A local flap involves repositioning healthy, neighboring skin over the wound site. A skin graft may be used if sufficient adjacent tissue is not available. This technique involves removing a small area of skin from another part of the body and using it to resurface the wound. Smaller wounds may be repaired by suturing the edges together and can be very-well hidden by natural folds of the skin. For skin grafts, donor skin from nearby areas of the body is often ideal because the appearance and complexion of the skin are very close to the area that needs reconstruction. Skin grafting techniques may use “split thickness” skin grafts which involves taking a thinner layer of skin that is taken from a donor site. There is also a method where a “full thickness” sample of skin is taken from the donor site. With the split thickness method, the donor site can regenerate and recover after two weeks. 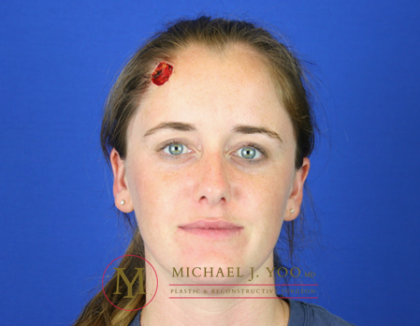 For full thickness methods, the skin has been completely removed, and the donor site needs to be sutured shut. Orange County patients who are in need of skin cancer treatment or reconstruction after removing skin cancer can schedule a consultation. If you have undergone skin cancer removal and are in need of reconstruction, please schedule a consultation. 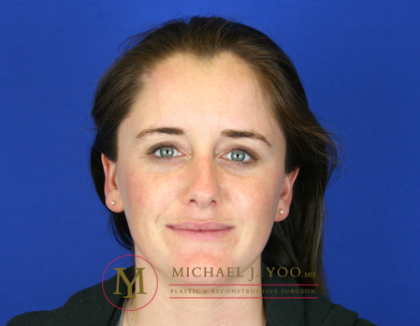 Dr. Yoo will be more than happy to discuss your options and determine if this procedure is an option for you. During your consultation, you’ll be able to meet with Dr. Yoo and our experienced staff to discuss your goals and come up with a plan that fits you. Contact our office today to learn more about your options.